Whilst there is a multitude of waffle makers for use at home, you may be looking for a commercial waffle maker for use in a business. Whether you need a waffle maker for a cafe, bar, restaurant or for a mobile catering business choosing one for commercial use can be tricky. As with any business decision, it needs some thought so to help you decide, our review will discuss three of the top products in this category and highlight what we believe to be the best commercial waffle maker available. 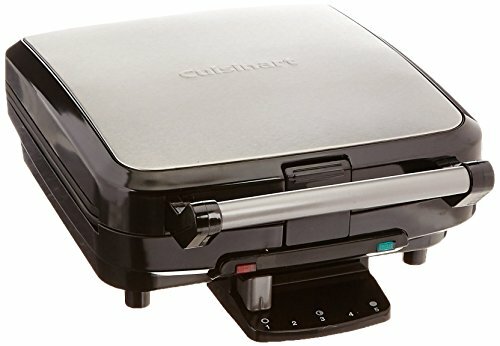 This Cuisinart commercial waffle maker gives you the ability to make four full sized waffles at a time and gives you control over the browning process so that you can vary each batch for either light or dark coloring. 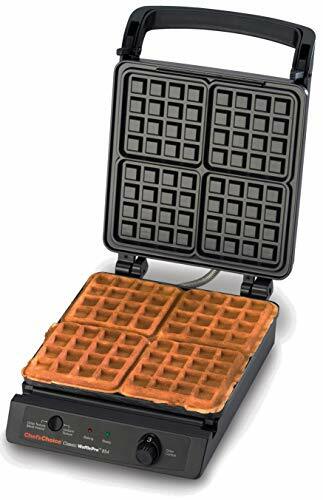 Any commercial waffle maker should allow you to make at least four waffles at a time and that is exactly what this product does. It has 1-inch deep slots within the cooking plates so that you can cook thick Belgian-style waffles for your customers. Cooking waffles with this machine couldn’t be easier, although if you or your staff are new to waffle cooking appliances, there is an instruction manual to explain the basics of how to use it. When you switch it on there is a red indicator to confirm this. The light is also a safety feature so that anyone coming close to the waffle maker is aware that the plates are hot. Once you have poured in your waffle batter, you simply close the lid and let the waffle maker start cooking. The lid’s handle locks when it is closed which reduces the chances of any batter, fillings or bits of waffle from falling out and making a mess. 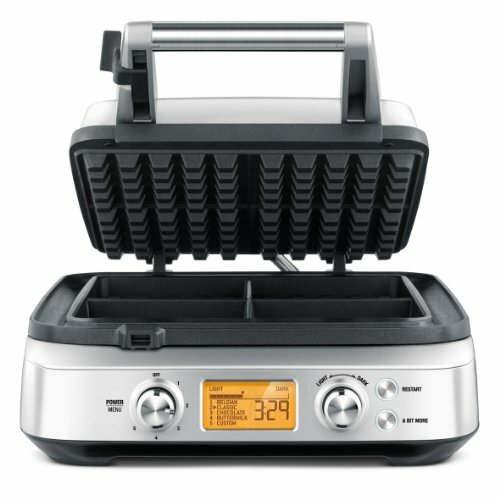 One great feature of this commercial waffle maker is it allows you to set the browning level of the cooked waffle. This means you can offer your customers waffles to their preferred color and crispiness. For those customers that like fluffy waffles, you would set the lever to setting 1 or 2, and for customers who prefer dark, crispy waffles you’d set it to number 4 or 5. A green indicator light will come on when the waffles are cooked and ready to serve. Both the top and the bottom cooking plates are coated in non-stick material, therefore, you should not have pieces of waffle sticking to them and requiring scraping off. Rather, you simply wipe them with a damp cloth to get them clean and ready for the next batch of waffles. In a high paced catering business environment, such as a cafe, this is vital as it reduces the serving time for each customer who is waiting for waffles. If you like to cook waffles to your customers’ personal preferences in terms of texture and color, then you’ll love this commercial waffle maker. It allows you to control texture and temperature so that every waffle you make is perfect. When cooking waffles on a commercial basis, only being able to cook one type of waffles is undoubtedly going to cost you customers. Waffles not only come in all shapes and sizes, but more importantly, they can be cooked to different colors and textures too, and everyone’s personal preferences will be different. So that you can offer each of your customers the type of waffle they like best you need to have a commercial waffle maker that allows you to cook waffles with different settings for color and texture. That is exactly what this Cuisinart commercial waffle maker does. For texture options, there is a very simple switch which you set for either crispy texture or a uniform texture. In conjunction with this switch, you also have multiple options for color which are selected using a dial. The lower settings will give waffles a lighter color, and higher settings mean the waffles cooked are going to be somewhat darker. To further assist when you are cooking waffles there are two indicator lights on the front panel of the waffle maker. The red light will come on when the waffle maker is up to temperature and ready. When it has cooked the waffles for the appropriate time based on the texture and browning settings the green light lets you know the waffles can be served. For both the red and green lights a beeper also sounds which is ideal if you are serving and do not have a direct line of sight to the control panel. The cooking plates are designed in the traditional square waffle shape with lined sections which separate them into four individual waffles. Thanks to the waffle maker’s high specification heating elements the cooking plates are ready to cook in no time at all, plus they will cook waffles in under 3 minutes. This will be a godsend for any fast-paced food business where serving customers quickly is a must. Cleaning the Chef’s Choice commercial waffle maker is made easy thanks to the cooking plates being non-stick so normally a damp cloth is all you need. If you are truly serious about cooking the best possible waffles for your customers and are prepared to spend a bit more on a commercial waffle maker to achieve this, then the Breville 4-slice waffle maker could be the one for you. 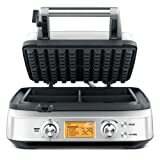 From the second you first set eyes on this stainless steel Breville commercial waffle maker you will see that this is no ordinary appliance. It is one of the larger waffle makers we’ve reviewed and measures over 18 inches on its longest edge. As the cooking plates are larger this allows for a spillage channel around the outside, so any excess batter is held there and not spilling out on the counter. Given that there are so many cooking features is going to be difficult to include them all in this, but we’ll do our best. Not only does this waffle maker give you maximum control over your how your waffles are cooked, it also has a digital cooking menu which you can view in an LCD display, so you know exactly what you are selecting. Before cooking you turn the left-hand dial to any one of 5 pre-programmed cooking settings thus you do not have to guess at the cooking time for any of them. The settings which are available are Belgian, Classic, Chocolate, Buttermilk, and Custom, and for each of these, the waffle maker will automatically adjust the cooking temperature and time so that the waffle comes out exactly as it should for each of them. In addition to these pre-set cooking modes, you also can set up the waffle maker to 12 different temperature settings. These will enable you to cook waffles to a color range between very light, to dark brown. There is an additional feature if you want to cook your waffles for just a few seconds longer to get them even crispier. It is called the ‘Bit More’ button and if you press it, the waffle maker will cook the waffles inside for a few seconds more, and thus increase their crispiness. The price of this commercial waffle maker means it is not one that you would not likely use for just an occasional waffle for breakfast. It is priced over $200 so certainly for commercial use, but once you see how well it cooks waffles and you’ve used the advanced features you’ll soon agree that it is more than worth that amount. This is a category where we have reviewed two high-quality commercial waffles makers under $100 and another which cost over $200, so quite a difference in price. However, when it came to choose the best commercial waffle maker we decided that if you serve food to customers you want to be using the best appliance you can. So, we have no hesitation in saying that the best commercial waffle maker is the Breville Smart 4-Slice Waffle Maker. We won’t go through all its features again, given that there are so many of them. Nevertheless, the fact that it offers users an incredible array of cooking options means customers can order waffles and have them cooked exactly how they like them. If you run a commercial enterprise you will know how important keeping customers happy is, so the fact that this waffle maker helps you do so makes it a winner.